I have to admit this is not the cake I originally planned. The marzipanned fruit cake started out with a red sugarpaste layer underneath a white sugar paste top layer. I had secured the red layer to the marzipan but the white layer was only secured (with sugar syrup) around the rim of the cake. The idea was to cut the design (a Christmas tree scene on the top and around the side) out of the white to reveal the red silhouette beneath. Best laid plans and all that! In reality I hadn’t let the red sugarpaste dry sufficiently before putting on the white top layer. Therefore, when it came to peeling off the cut-outs, I found that the red sugarpaste had sweated and adhered itself to the white in places where I had not secured with the sugar syrup. It was a complete disaster! The edges of the cut-outs were torn and ragged, not clean and crisp. and the supposedly red silhouettes that should have been revealed beneath resembled a grubby dark pink marble where I had tried to remove or blend in the white sugarpaste residue. Not the result I had envisaged. The only thing to do was strip it all off and start again. I had already made a couple of 6inch cakes as token Christmas gifts for my in-laws and their Christmas Wreath design had been a relative success. So for round two, I thought it better to stick with what I knew would work this time. 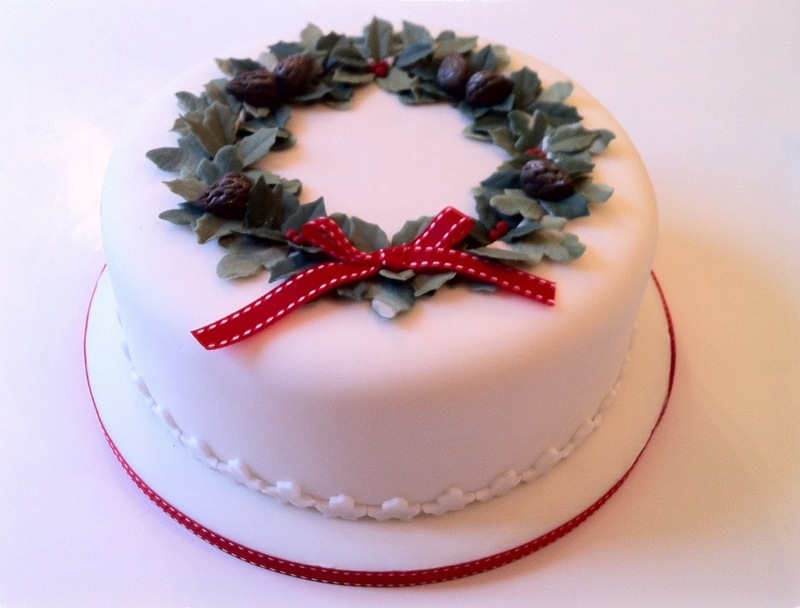 For the Christmas Wreath I put a thin 20cm disk of white sugarpaste on the top of the marzipanned cake. On top of that I put another standard thickness of white sugarpaste securing only on the cake side with sugar syrup. I then cut out a circle through the top layer of sugar paste on the top of the cake to reveal the layer below. This would form the template of the wreath around which the sugarpaste foliage would be arranged. As this cut-out and removal operation was a success (as it had been with the smaller cakes) I can only assume that my earlier disaster was down to the red colouring in the red sugarpaste that must mean it holds a lot more moisture, or makes it stickier, than your standard white sugarpaste? To make the wreath leaves I decided to finally put into practice some of the skills I had learned at cake school. I mixed the centre cut-out with white flowerpaste – half and half to help roll out the sugarpaste super thin – and divided into six balls. Using paste food colour (e.g. Holly Ivy green ) I coloured the balls different shades and depths of green. For holly leaves I made the green much darker and ensured the paste colour was thoroughly mixed in. For Ivy I used some lighter, brighter shades and left a more marbled effect between the green and white to give a variegated effect. I used Holly and Ivy leaf cutters and veiners to create the leaves. I then rubbed the leaf edges using a ball end tool on top of a foam mat to make the edges elegantly thin and to give the leaves more of a 3D than 2D feel. I then left them to dry. I placed the dried leaves around the cut-out circle (some facing in, some facing out) mixing the leaf types, sizes and colours in an organised fashion. I then rolled out some very small balls in red sugarpaste to make holly berries. I also made some pine cones using brown sugarpaste with the arrow head tool to make the needles. I brushed these with edible lustre to give them a festive look. I have to admit I was quite impressed with how these looked in the end as I had sat there for about 20mins quite stumped at how to make the brown cone shaped blob look more pine-coney. However, my critics were not that impressed, with one person asking why I had put squirrel poos on the cake… a bit harsh I thought. The piste de resistance was a bow in red ribbon which I stuck to the cake using a red dress making pin through the bow knot. I placed the cake on an iced drum board decorated with a ribbon and hid the bottom edge of the cake with Ivy leaves cut out of white sugarpaste and stuck on with Grandma White Sofa’s Bacardi (sorry Grandma). Considering the catastrophic disaster that it started out as, I was really happy with the end result. Probably my most impressive cake (to look at) so far. It also tasted quite good too.